Ahh, the South West Monsoon....which brings to KL and many parts of Malaysia the dreaded HAZE!!! 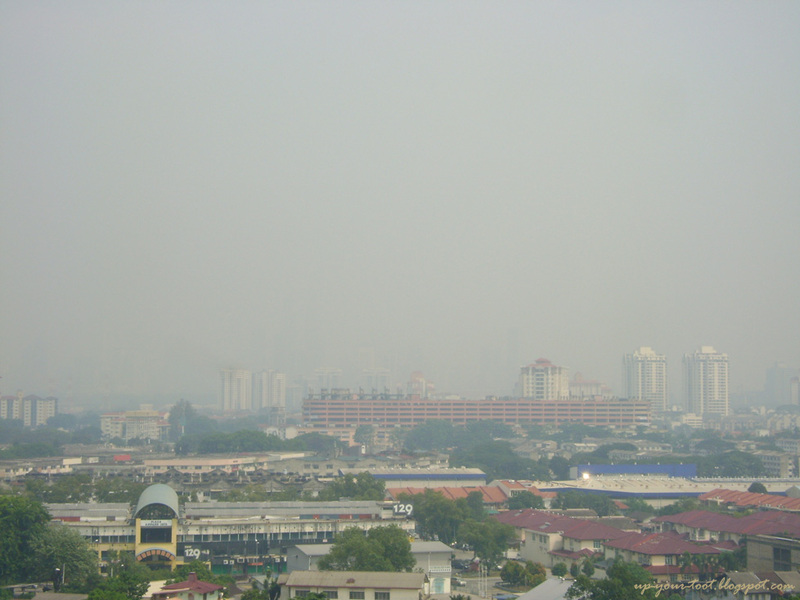 The Air Pollutant Index (API) in several parts of the Klang Valley rose above the 100 mark today. A quick look out of the balcony in the morning revealed the usual sight of the KL skyline minus a lot of buildings, especially the Petronas Twin Towers and KL Tower, which is a sure indicator that horizontal visibility have dropped and the API is not good. Since 1990, this haze has become an annual, predictable occurrence that only varies in severity and duration from year to year (look at this post from last year). Hmmm, a hazy KL skyline in the morning = bad air quality. A look at the Malaysian Department of Environment website shows that the air quality had worsen in the afternoon for many spots in Selangor, with Port Klang having the highest API of 147 at 5pm. 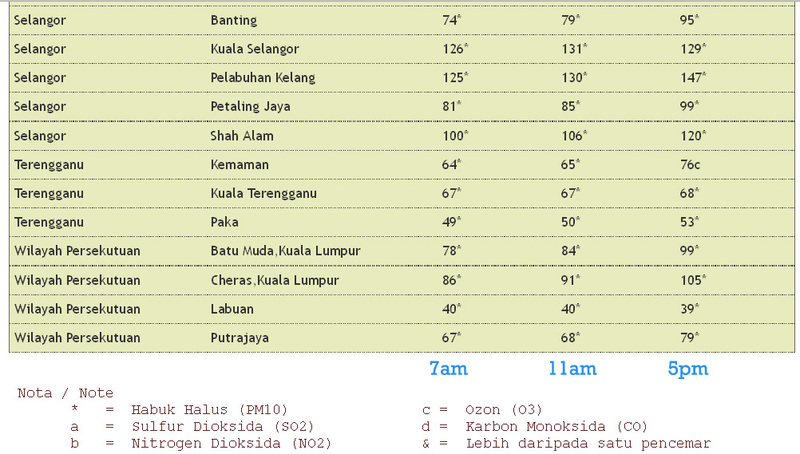 The API index as percentages of areas in Malaysia for 11am and 5pm by Department of Environment Malaysia. 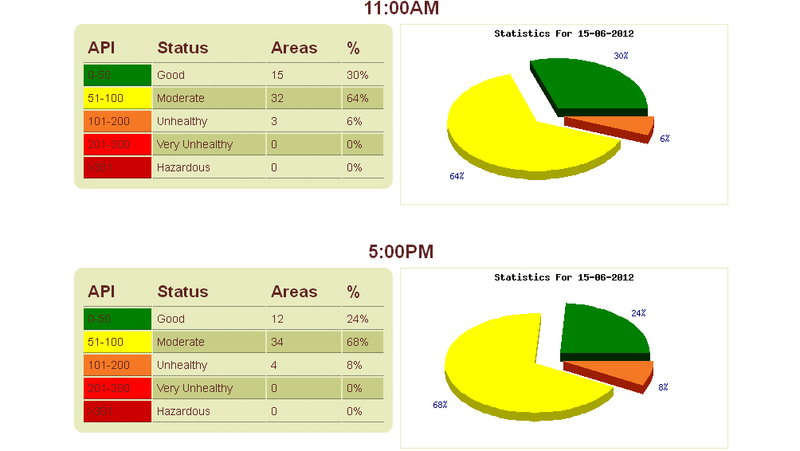 The percentage area with unhealthy API rose by 2% from 11am to 5pm. 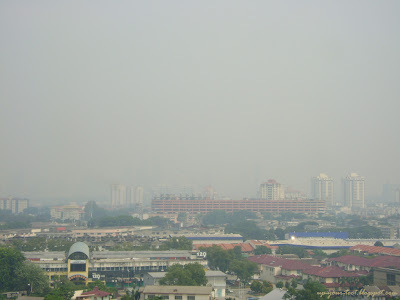 Part of the API index listing provided by Department of Environment Malaysia for 15 June 2012, showing several areas of Selangor having unhealthy API. 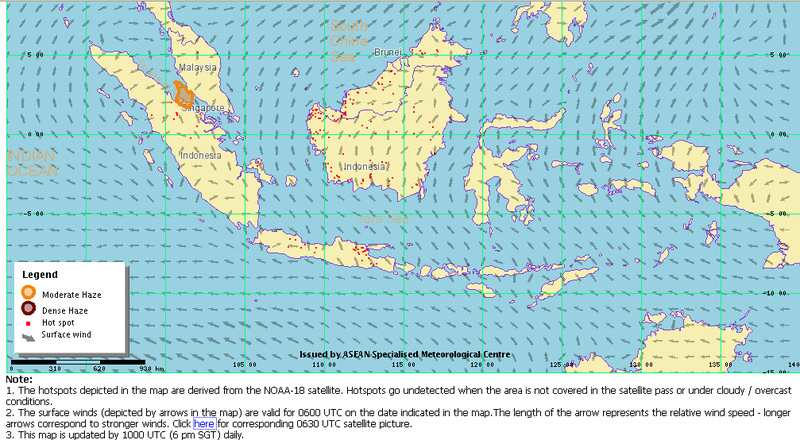 From the map provided by ASEAN Specialised Meteorological Centre (ASMC), it appears that the hotspots in Sumatra are most likely to be responsible for the haze over in Klang Valley, given the surface wind direction. Hotspots are most likely peat forest fires that smoulder as the underground peat layers burn away. Map from ASMC site showing the hotspots and prevalent surface winds. The South West Monsoon usually runs from June to September, and brings about drier weather to the West coast of Peninsular Malaysia. This monsoon system is different from the Indian Monsoon (also South Westerly winds), thought both systems do interact. During the summer months, the land mass of Asia (China) warms up due to the approaching boreal summer. The warm rising air creates a low pressure area. At the same time, the deserts of Australia are approaching winter, thus the cooled air drops and creates a high pressure spot. The difference in pressure causes the dry air from the Australian desert to move south-easterly and upon crossing the Equator, becomes a south-westerly wind due to the Coriolis effect. This dry wind brings about drier weather, especially to the eastern parts of Sumatra and western Peninsular Malaysia, thus escalating the peat/forest fire situation. The northern tip of Sumatra and parts of north-western Peninsular Malaysia however, may receive decent rainfall due to interaction with the Indian Monsoon system. Perhaps I would need to do a rain dance and pray that my dancing is that bad, it makes the heavens cry. I am still unsure if rain dances must be conducted naked or clothed…anyone?? UPDATE: I got back home at 10.30pm and guess what...the lights from KL Tower were not visible whilst those from the Twin Towers were just barely visible. Hazy indeed. At 10.30pm. 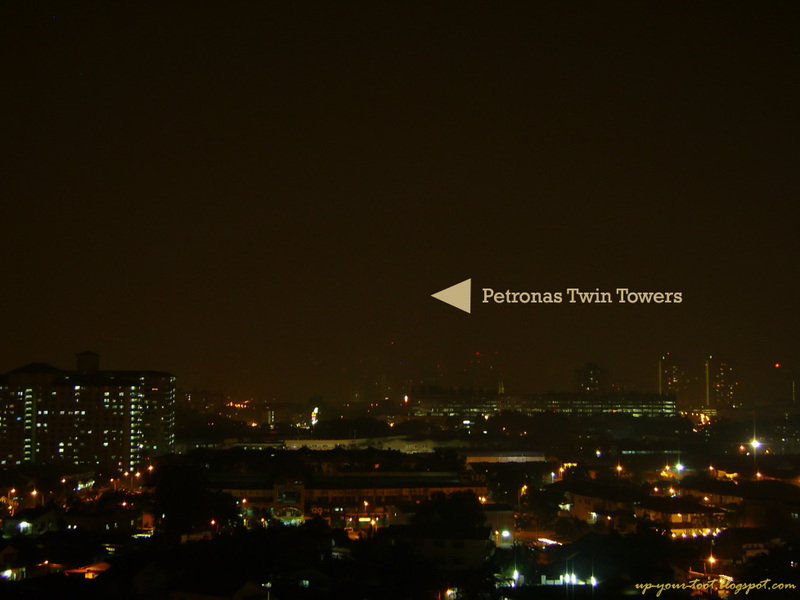 the lights from the Twin Towers were just barely visible, a far cry from the usual glittering pair of phalluses in the KL night sky.